John Pilger's new documentary The Coming War on China was released last week in selected UK cinemas and broadcast on ITV. Filmed over two years across five potential flashpoints in the Asia Pacific, it reveals the build-up to war on more than 400 US military bases that encircle China in "a perfect noose." Pilger said that the US and China may be on the road to war, and nuclear war is no longer unthinkable. What drove Pilger in making this film? What are the stories behind the investigative shooting? Global Times (GT) London Reporter Wei Sun interviewed Pilger about his new film and observations on the China-US relationship. GT: What drove you to make this documentary? When did you start it? Pilger: The Coming War on China has taken more two years to make. I have made numerous films in Southeast Asia, where I reported as a foreign correspondent during the time of the Vietnam War and Pol Pot. I had not been to China for a generation and felt a film about the US and China today was long overdue, especially one that challenged the stereotypes and myths that undermine our understanding of the rise of China. The Coming War on China is really about rapacious "gun boat" power and asks audiences in the West, especially in the US and Britain, to "look in the mirror." Since 2009, I've followed developments in the Philippines. That was the year Hillary Clinton, then US Secretary of State, flew to Manila and demanded the return of a major US military presence. In the 1990s, two of the biggest US bases in Asia, Subic Bay and Clark, were closed as a direct consequence of a popular movement against the violence generated by the bases among local communities. With bribes in the form of military hardware, Clinton persuaded the government of Benigno Aquino to accept five "rotational" US bases - to counter Chinese appropriation of unoccupied islets in the strategic Spratly Islands (Nansha Islands in China). At that time, China and the Philippines were negotiating the disputed ownership of the Spratlys; and Clinton declared the South China Sea vital to America's "national security interest." The issue, she said, was "freedom of navigation." In fact, the issue was China's rise as an economic power and the insecurity of the top dog in Washington. What had been a regional dispute was now a flashpoint between the US and China. In 2011, President Barack Obama announced his "pivot to Asia" - this meant the transfer of 60 percent of US air-naval forces to the Asia Pacific, with China the undeclared target. This was the starting point of the film. GT: So far, what kind of feedback have you received? What do you think British cinemas and TV channels value most about your film? 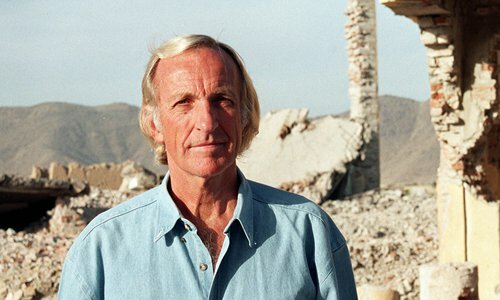 Pilger: This is my 60th film and I have a history in investigative film journalism, mainly on television. My first film, The Quiet Mutiny (1970), revealed an insurrection in the US conscripted army in Vietnam that led to the withdrawal of all US forces. Britain has an eclectic and often proud documentary history and the British public has grown used to challenging films - though not so much lately. The Coming War on China had a substantial TV viewing audience last week. Reviewers have given it four stars (the Guardian, Radio Times). More than newspapers or other popular media, documentary films have the license and power to help people make sense of the news, and the world. In the "China Rises" section in my film, the archive film of China as a colonially subjugated society is astonishing; that no Chinese was allowed to enter the United States legally for 100 years is revealed as hidden history. Who knew? Yet, the ripples today are obvious, or ought to be. GT: You mentioned in the documentary that there are more than 400 American military bases encircling China with missiles, bombers, warships and nuclear weapons. How many US overseas military bases did you go for investigation? Pilger: I have been to many US bases in Asia over the years. Today, it's increasingly difficult. I passed through the Ronald Reagan Missile Test Site on Kwajalein Atoll in the Marshall Islands. Here, Star Wars weapons are tested; missiles are fired as part of the secretive Space Fence project. This base is one of America's stepping stones to Asia, and was set up in 1968 to "counter the threat from communist China." I often film undercover, and that can have its uncertain moments. GT: You have spent two years making this film and traveled a lot of places. Who did you meet in the countries especially in China and US? Do you think the rivalry and even hostility between the two countries is becoming more apparent? Pilger: I met senior officials in the US State Department, and those with considerable influence in China. I interviewed war planners, academics and ordinary people resisting the threat of nuclear war, notably on Okinawa which has 32 US military installations and China as a target. There is a remarkable sequence with a former US Air Force missile serviceman who witnessed, on Okinawa, the final moments of the mistaken launch of a nuclear missile at China during the 1962 Cuban crisis - and which was halted only after an alert officer realized the order was false and stopped the countdown at gunpoint. One strategist in China told me, "We are not your enemy, but if you [in the West] decide we are, we have to prepare." GT: You mentioned that the aim of this film is to break a silence about the renewed possibility of conflict, even nuclear exchange, between the United States and China. There has been a lot of discussion about the outbreak of war between China and the US. Do you think it is more likely that conflict will erupt now compared to the past? Pilger: What I do know is that the new Cold War is, in one respect, more dangerous than its predecessor. During the first Cold War, there were red lines that the protagonists dared not cross; these were well defined. Now there are no red lines. The German foreign minister said as much the other day. NATO forces are on the western borders of Russia - unthinkable 60 years ago - the US and China are skirmishing in the South China Sea, and the US Navy is rehearsing a blockade of China's oil and trade routes. GT: What's your observation and prediction on China-US relationship and geopolitical situation with Trump coming to power? Pilger: I'm not a futurist; but Trump's clearly deliberate provocations on Taiwan and trade spell danger. I'm not suggesting he wants a war with China; but with the US military on China's doorstep with Aegis and THAAD missile systems, and saber-rattling rather than diplomacy the order of the day, there is a landscape of potential mistakes and accidents between the two countries. These are fragile times.